Time once again for EtsyMetal’s ‘Blog Carnival’, where our group blogs simultaneously on a selected topic. 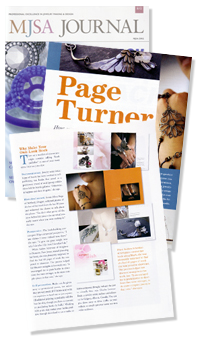 This month’s topic is about the role of family in our creative lives. For me, another EM project started me thinking about family again… our August ‘monthly challenge’ project was a homage to Alexander Calder (which you can find here, with an entry from yours truly and lots of other fabulous members!). Calder was a figure that loomed large in our home and it got me thinking about growing up in a family that took so many cues from the artists & thinkers of the times. Alexander Calder was a master of using what was at hand to make new and useful objects. What today we refer to as ‘repurposed’ was long ago a way of life and source of invention for creative souls. If reinvention were a religion, my dad was a high priest. Constantly making, taking apart, and re-thinking, my mom could never get attached to much. Where was that rocking chair he built for her before we were born? Whoops… not perfect, let’s disassemble that and see what else it can be. And on and on it would go. Still today we search for things, unsure if that distant memory may be tucked away intact, if it’s been reconstituted beyond recognition, or offhandedly given to a friend or acquaintance. Value is of no serious matter… a rock of no particular pedigree, but possessing a beautiful shape or interesting striation, a cross section peach pit, bits of leather or shell, he would find a purpose and make it a success. 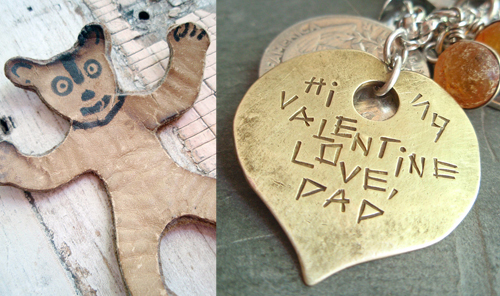 Some of my treasured memories are wrapped up in the little incidental things I collected along the way from my artist dad… the tiny leather bear he made for me when I was so small, the valentine banged out of the top of an old brass key & inscribed as only he could (see these above). Doesn’t everybody’s dad spend his free time chiseling life sized figures on slates in the back yard or lettering verse from ‘Alice in Wonderland’ into wet concrete blocks poured for the back steps? There was a time that I thought so. But she does know, more than anyone. 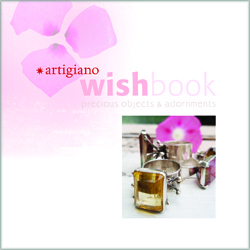 the potential to become someone’s unique treasure… to work it and somehow ‘make the invisible visible’. the one with the magic in it. A really beautiful story! I could totally see your mother rolling her eyes at you about the beach rock. What a wonderful family you have and what special things your dad made for you. I love your valentine key ring. You’ve really made me think about gift I would like to give to my family. 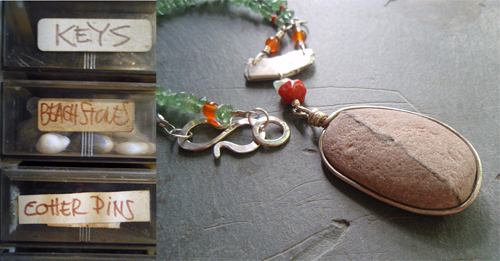 It so happens that just last week I remembered I have a small jewelry box stashed away on my studio shelf. It’s filled with the tiny little stones or glass that my Dad picked up during his long daily walks; whether near home or on travels. It just made my eyes water to hold them and to think on what my Dad thought was special about each one. 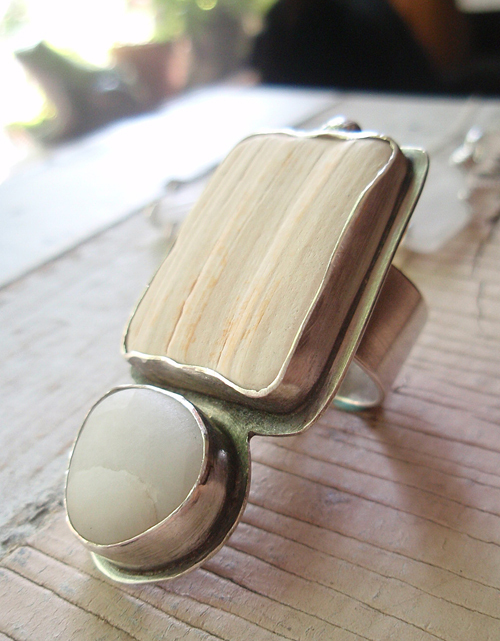 I love to hold in my hands a piece that someone has created or belonged to them. I’m so happy that little pebble collection is with me now. Has no value but fills me with sweet emotions! A wonderful story!! I am one of your biggest fans. Thanks for sharing. such a wonderful story! so heart warming. I remember your dad walking home from work, often past my house, his pack thrown over one shoulder. Our sidewalks were very well used back then, the dads walking down the street in the mornings, and walking home in the evenings, your dad from his shop, others from the bus on the corner. Always a smile and a wave, but it was time to get home for dinner. One day I went into you dad’s shop. I handed him an angel figure that dangled from a key chain. One of her wings had broken off. I asked him if he could fix it and as he carefully turned it over and looked at it he gave the diagnosis that it could not be fixed. But he said don’t worry I’ll make you a new one and I promise the wings won’t break off. Your dad made a new one out of brass. When it was completed I asked him how much I owed him. He replied “Nothing, you see once I sign it with my name and Sue”s name I will not accept any money.” I gratefully accepted the gift and it is now hanging from my dresser mirror as a reminder of this gentle, generous and loving man. He will always have a special place in my heart.